Over the decades we have made attempts to start fruit trees amidst gophers, deer, raccoons and an occasional bear. While our more recent efforts have met with some success, there are only three survivors from earlier campaigns. One of those trees is a prune plum given to us by our good friends June and Bobby Vandergriff. If you could see this poor little specimen you would never believe it was twenty years old. The road-side of the tree gets severely pruned by the deer population every summer. The other half of the tree hangs over the fence guarding the vegetable garden. Given the Vandergriff connection, I simply could not get rid of the tree when it continued to give tiny fruit that ripened in one day – ripened and fell on the ground in a 24-hour period. Once it hit the ground, the fruit was gone, carried off by a myriad of happy little critters who live in this neck of the woods. This year I determined to grab the fruit before the local fauna had their prune plum party. We have been in a mode of using our untapped assets and this fruit fell in that category. I watched the tree daily, taste-testing for sweetness. These tiny plums have dense flesh with high sugar count when they are ripe. No wonder all the animals show up for the drop! This year we got the bulk of the harvest. What do you do with tiny prune plums that cause human-types to turn up their noses? After all, the late peaches, figs, and grapes are in abundance at the same time as the prune harvest. 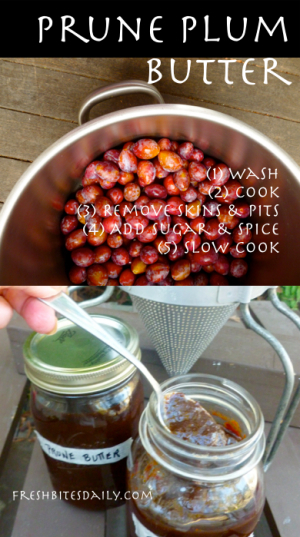 We made prune plum butter! Actually, the process required little sweat equity. The boys picked the plums and brought them up to the house. That’s almost as much fun as finding Easter eggs, so it doesn’t count as work. The only labor-intensive part is putting the cooked prunes through a sieve to get rid of the skins and pits. My brother was visiting and thought this looked fascinating so we did that together. It was fun. The sieve element wasn’t work either. The long cooking was in the crock pot almost eliminating the possibility of burning the plum butter. An occasional stir was all that was necessary. Then, of course, it was necessary to do a taste test, or a couple of taste tests. What follows is more a description of the process than it is an actual recipe. This process can be used with any fruit or berry that has great flavor but is a great nuisance with peel or seeds. In Delano we had a wild plum that produced tiny sour fruits and made the most amazing plum jam we’ve ever eaten. Whether you are growing prune plums, this little description could help you figure out what to do with some of your untapped assets. Pick the fruit and put it in as large a container as possible, or several small containers. You need enough room to pick through the fruit, removing stems, leaves, and any garden debris you accidentally picked up. Wash the fruit using a fruit and vegetable soap. It’s shocking how much dirt washes off clean looking fruit. 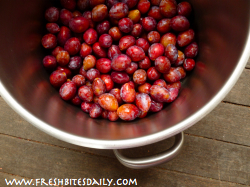 Allow the prune plums to drain and then put them in a large pot with enough water to put 1/2 inch of it in the bottom of the pot. Place the pot over a low flame and top with a good fitting lid. Stir the plums every now and then to ensure even cooking and to prevent the cooked plums on the bottom from burning. When the skins are coming off the plums and the pits are beginning to pull loose, the plums have cooked enough to strain. Use a hand strainer of some sort. A Foley food mill works well. I use an old fashioned cone-shaped strainer with a wooden cone-shaped tool to facilitate the process. Separate as much of the the fruit pulp from the skin and pits as you can. 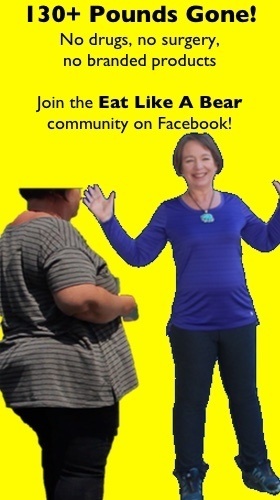 Send the skin and pits to the chickens or to the compost. Place the fruit pulp in a crock pot. Add a bit of sugar and taste. Add more to suit yourself. Add three cinnamon sticks, about ten cardamon pods, and ten whole cloves. This was seasoning enough for pulp that filled a large crock pot about 2/3 full. You may want more spice. This is pretty mild. Add the juice of one or two lemons. Taste as you go and decide how much lemon you need. Set the crock pot on low heat and cover it partially. Try placing a wooden spoon across the top of the pot before placing the lid. This allows the steam to escape and the fruit to roast rather than stew. Stir the pot every few hours and just before going to bed. Stir first thing in the morning. Remove the spices in the morning. They may get bitter if allowed to roast too long. About the end of the second day your plum butter will be ready for use. Refrigerate it in glass containers or can it in an open kettle. 1 Comment on "What to do with extra-small pit fruit? 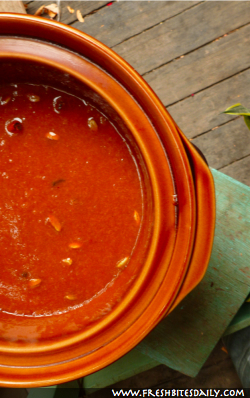 Here’s your plan (with a plum recipe)!" My mother has a Prune Plum, she has had it for 25 years and its still small. My mother used to make a delicious jam with the plums. I kinda miss it.